NetFlow Auditor constantly keeps its eyes on your Network and provides total visibility to quickly identify and alert on who is doing what, where, when, with whom and for how long. NetFlow Auditor is a game-changing network auditing technology that complements existing network and security management suites enhancing the visibility, security, reliability, resilience, and trustworthiness of your digital infrastructure. It delivers a complete and flexible kit for flow based network anomaly detection, forensics and analysis. Provides alerting and 20:20 vision to Network professionals of varying backgrounds of all point-to-point data conversations. 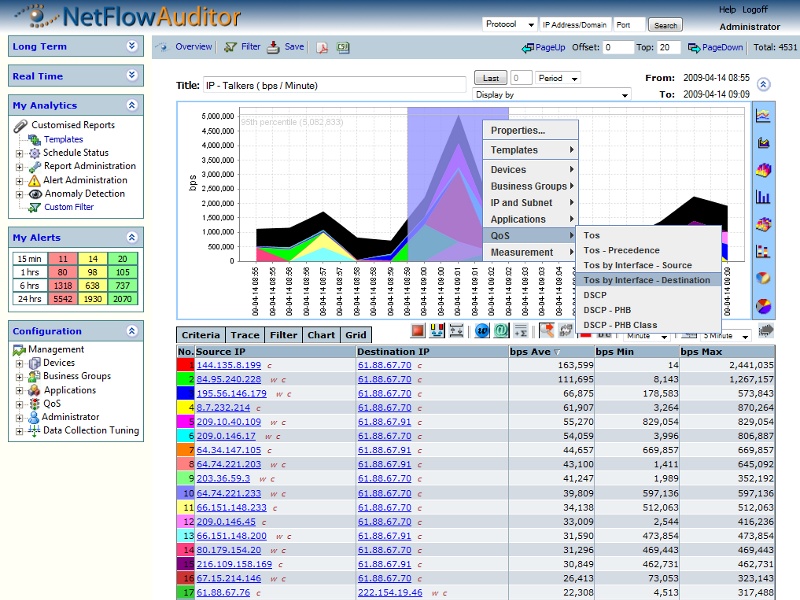 NetFlow Auditor collects, archives and provides network data intelligence to help organizations quickly identify and alert on network anomalies to help resolve performance problems and manage network security and compliance across business services and applications, dramatically reducing the risk of potential business downtime. NetFlow Auditor learns and alerts on network behavior baselines substantially reducing false positives. It is non-intrusive, highly fault tolerant, scalable, granular and flexible with real-time monitoring, long-term trending, reporting and alerting for; Network Security forensics, DDoS, NBAD, Intelligent Baseline Alerting, Real-time and Trending analysis of Usage, Packets, Conversations and 95th percentiles for security, capacity planning and billing purposes. With unique features but with simple sophistication to compliment your knowledge, NetFlow Auditor will provide the scalability, flexibility and granular depth to meet all your flow-based network management needs. This site does not contain serial number, crack, keygen NetFlow Auditor serial number : serial number is the simplest type of crack. A serial number(cdkey,product key,etc) is register the program as you may already know. a crack or keygen may contain harmful software. If you cannot find the exact version you want, just give it a try. for more information read .nfo/.txt/.diz file include in zipped file.